TOM - Fahrenheit member Wu Chun more popular than ever. During the first half year, Wu Chun has done movies, drama’s, commercials. Speaking of multi-pronged. During the first half year Wu Chun has already earned over the 10 million. In contrast to Calvin Chen, another member of Fahrenheit, which has only performed last year in the drama’s ‘Romantic Princess’ and ‘The X-Family’. And only earned money with ‘Fahrenheit’, without earning solo. 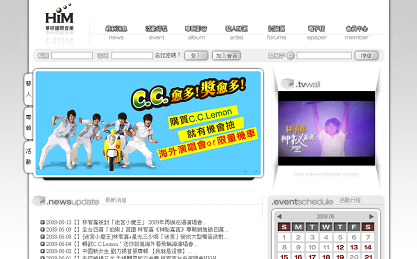 Calvin Chen’s fans complained on HIM official site, stating that the company didn’t treated Calvin Chen’s fair enough. Wu Chun mentioned to be in Hot Shot (籃球火), Aaron has Pi Li MIT (霹靂MIT), Jiro Wang just filmed Rolling Love (翻滾吧！蛋炒飯) and received the drama Superstar Express (愛就宅一起). Only Calvin Chen didn’t had a drama to shoot, the differential treatment is too big. The results from Wu Chun were the best, in addition to the maintenance of goods last year. Speaking of his contract with an Arm Chair company that still apply. This year, he and his past screen partner Ella were invited to be the spokesman of the sports drink Supao. The 3,000,000 Yuan worth individual advertisement price tags that can be compared with the earnings from Ella since she has stepped into the media world. Wu Chun is recently busy in Shanghai with Twins member ‘A Sa’ to film a new movie called ‘Butterfly Lovers’, and is Fahrenheit’s first leaps to jump onto the big screen! Note: Do not steal translation without permission first! Article reporter: Chinese article written by an unknown reporter from Tom. congrats to chun! he earns a LOT. Aww, Poor Calvin.. I want him to be the lead role in a drama too..
Miyavi wrote: Aww, Poor Calvin.. I want him to be the lead role in a drama too..
yah..me too. now calvin just like he is left behind.. :( the others get to acting in drama but he doesnt have any. feel sad for him lah ..
and ofc !! congrats too chun !! Jia You !! That's what HIM Music said. ha, ha, ha! !1 maybe he could give some to charity! really? hhaha, if yes sorry then! But that is was HIM Music said, and not Calvin. And I think Calvin should say it by himself. i can't believe it... how i wish i will earn that money too. lols <3 i like to have that too but i like calvin to have dramas more than having 10 M lols. i guess.